齐士格, 王志会, 王丽敏, 王红, 张晗, 李志新. Qi Shige, Wang Zhihui, Wang Limin, Wang Hong, Zhang Han, Li Zhixin. Qi Shige, Wang Zhihui, Wang Limin, Wang Hong, Zhang Han, Li Zhixin. Incidence of activities of daily living disability and related factors in community-dwelling older adults in China[J]. Chinese Journal of Epidemiology, 2019, 40(3): 272-276. Abstract: Objective To analyze the decline of activities of daily living (ADL) ability and influencing factors over a period of 2 years in community-dwelling older adults in China. Methods The study subjects were from the project of Prevention and Intervention on Neurodegenerative Disease for Elderly in China of 2015-2017 to select the samples. In 2015, a total of 23 803 community-dwelling residents adults, aged ≥ 60 years old, came from both urban and rural areas, were selected through a stratified multi-stage cluster sampling in 6 provinces and joint baseline survey. The follow-up was conducted in 2017 to collect the related information using the same questionnaires and examinations. Finally, 18 785 elderly people were included in this analysis after excluding those who were died, failed to follow up, had incomplete data cases or defined as ADL disability at baseline survey. 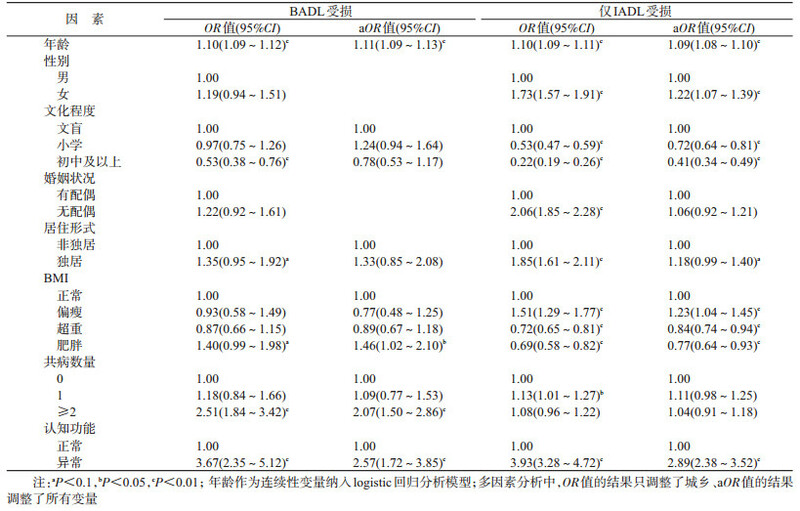 The post-stratification weight on the sample data was done by using the 6th national population census data as the standard, the rates of ADL/basic activities of daily living (BADL)/instrumental activities of daily living (IADL) disabilities over 2 years were calculated and compared among the elderly with different characteristics. Multiple logistic regression models were used to analyze the factors associated with BADL/IADL disabilities. Results During the 2-year follow-up, ADL disability developed in 1 959 participants with a rate of 12.0% (1.6% for BADL disability and 10.4% for IADL disability only). Multivariate logistic regression analysis showed that the risk factors for BADL disability included increased age, obesity, comorbidity and cognitive impairment. The risk factors for only IADL disability included increased age, being female, lower weight and cognitive impairment. Compared with illiterates, the educated had lower risk for only IADL disability. Compared with those with normal weight, overweight and obese old people had lower risk for only IADL disabilities. Conclusion Increased age and cognitive impairment were associated with the increased risk for BADL and IADL disabilities. Older people with comorbidities had higher risk for BADL disability. Obesity increased the risk of BADL disability, but decreased the risk for IADL disability in older people. Women had a higher risk for IADL disability compared with men. Being educated was associated with lower risk of IADL disability. WHO. World report on ageing and health[EB/OL]. 2015. https://www.who.int/ageing/publications/world-report-2015/en/. 李真真, 汤哲. 老年人失能的流行病学研究进展[J]. 中华流行病学杂志, 2016, 37(7): 1047-1050. 钱佳慧, 吴侃, 罗会强, 等. 中国老年人日常生活活动能力损失现况及影响因素分析[J]. 中华流行病学杂志, 2016, 37(9): 1272-1276. 顾大男, 曾毅. 1992-2002年中国老年人生活自理能力变化研究[J]. 人口与经济, 2006(4): 9-13. Gu DN, Zeng Y. Changes of disability in activities of daily living among Chinese elderly from 1992 to 2002[J]. Populat Econom, 2006(4): 9-13. 李真真, 汤哲, 王荣. 中国7个城市老年人失能现状调查[J]. 中华流行病学杂志, 2016, 37(12): 1561-1564. 罗杰斯, 吕跃斌, 殷召雪, 等. 中国长寿地区65岁及以上老年人生物标志物与日常生活自理能力的关系[J]. 中华预防医学杂志, 2017, 51(11): 1012-1018. 伍小兰, 刘吉, 董亭月. 中国老年人生活自理能力的纵向动态研究[J]. 老龄科学研究, 2018, 6(1): 28-45. Wu XL, Liu J, Dong TY. Longitudinal dynamic analysis of Chinese elderly's activities of daily living[J]. Sci Res Ag, 2018, 6(1): 28-45. 中国肥胖问题工作组数据汇总分析协作组. 我国成人体重指数和腰围对相关疾病危险因素异常的预测价值:适宜体重指数和腰围切点的研究[J]. 中华流行病学杂志, 2002, 23(1): 5-10. 李涛, 王华丽, 杨渊韩, 等. 中文版《AD8》信度与效度的初步研究[J]. 中华内科杂志, 2012, 51(10): 777-780. 张明园. 精神科评定量表手册[M]. 2版. 长沙: 湖南科学技术出版社, 1998: 183-188. Zhang MY. Handbook of rating scales in psychiatry[M]. 2nd ed. Changsha: Hunan Science and Technology Press, 1998: 183-188.